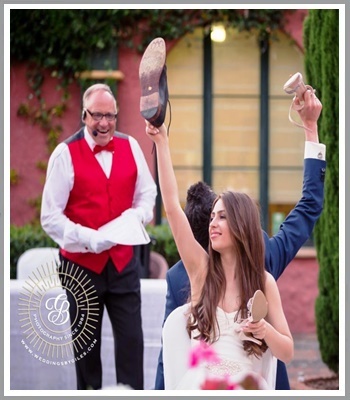 Allan Davies Celebrant Services is based in Andalucia, Spain covering areas from Almeria to Nerja, all of the Costa Del Sol , Malaga, Cadiz, Grenada and Cordoba provinces. There are occasions during these happy times of marriage blessings, birthing and naming ceremonies when perhaps the smooth operation of the service, the after party and reception, through to the departure of the happy couple or parents and baby, needs a steady, calm, organised, guiding hand to keep things flowing, informing people of what is going on, following a programme to make sure the revelry, meals and celebrations continue in a smooth well organised pattern. No more so is this usually most beneficial than after the marriage blessing, whereby a Master of Ceremonies/Toastmaster takes discretional charge of the proceedings, helping, introducing, calling for and in waiting for any requirement by the parties involved. 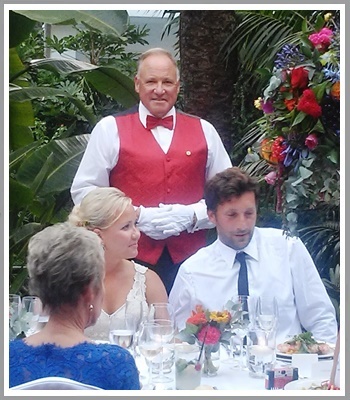 An MC is a person whom discretely ensconces himself within the celebratory group, after a pre discussion and post celebrant briefing to make sure all carries on smoothly and in accordance with the organizers and involved parties wishes. Sometimes it’s helping with seating, introducing the happy couple or celebration group, the individuals, congratulating certain people. Calling upon certain people to speak, making announcements like ‘please turn off your mobile phones’ and the suchlike……whatever it is, having a voice and a central focal point should someone require something is sometimes a blessing in itself. Having that authoritive aire of someone standing within propinquity of the couple wherever and whenever required, can only help them be calmed and assured that help is always there should they need it, knowing that when it’s time to progress with proceedings, everything moves along smoothly with understanding, ease, consideration and support. It transpires that, at functions where there are so many people speaking and moving about, the excitement of the day, the heat and revelry thrill can cause some people to act out of their normal character. So having an MC/Toaster like myself to assist and help can smooth the situation. For example…from the calling to the tables for the meal, the announcement of the best mans or nominated speakers speech, to the calling on the floor for the happy couples first dance. If you consider this option, as a lot of people do, then I dress accordingly so there is no doubt who I am or what my duties are even though I will be discreet as appropriate. During all ceremonies, to enhance my professionalism, I remain alcohol free and never smoke.